This delightful postcard has a caption in German which reads "Wer die Wahl hat, hat die Qual!". This translates in English to "Heavy is the head that wears the crown!". 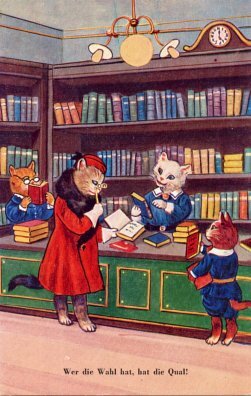 Is the intent to portray the mother cat as having trouble deciding on a book or books for her young one? I was thinking a more appropriate caption might be - "So many books, so hard to choose!". What would your caption be? ﻿It's been a rough winter in many parts of the country this year. I'm sure that a few pictures have been taken of libraries in the snow. 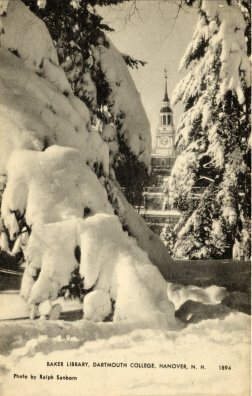 Here are three postcards from my collection that show libraries in snow. 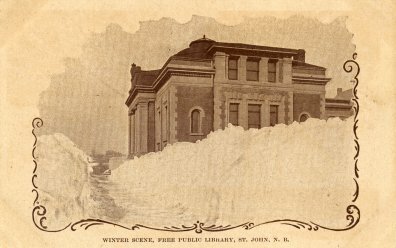 I have a previous post about a postcard showing the Elroy (WI) Public Library in the ice storm of 1922. 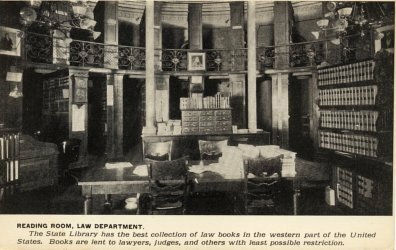 The California State Library used a picture postcard (see above) to promote its Law Department in the period around the early 1920s. The postcard which shows the Law Dept. Reading Room proclaims that the State Library has "the best collection of law books in the western part of the United States". It goes on to say: "Books are lent to lawyers, judges, and others with least possible restriction." Today the State Library law collection is named the Bernard E. Witkin State Law Library. A few other libraries have also used postcards to promote their services. 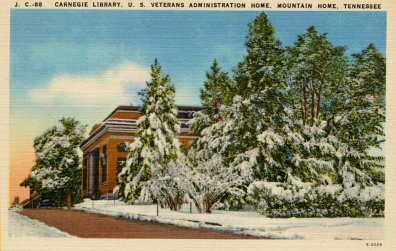 The Ohio State Library used postcards to promote its traveling library service and the American Library Association used postcards to promote its World War I Library War Service. Additional information: The photo on the postcard shows the law library very early in the 20th cnetury when it was in an apse on the East side of the historic State Capitol Building. The law library eventually moved to a new Library and Courts Building which was completed a decade after the end of World War I. The portion of the Capitol where the law library was formerly located was demolished later to make way for a new East wing.Thanks to Cy Silver, a former law library supervisor, for this information. Gleeson Library/Geschke Center is pleased to announce a new service for USF Faculty: Document Delivery. As you may know, Gleeson has been delivering library books to Faculty for a few years. Now, Faculty can request electronic delivery of journal articles, book chapters, microfilm, and government documents from the library’s print or digital collections. Going forward, the library will make every effort to fill all requests, whether we have the material in a bound volume, in a database we subscribe to, or in almost any other form. Faculty can make Document Delivery requests easily through ILLiad. Gleeson has used ILLiad for years to deliver journal articles and other material requested from other libraries. We’ve enhanced ILLiad to facilitate the request and delivery of material that we have here. Questions? Feel free to contact us. We hope you find this new service useful!